While not a member himself of the Templar Order, St. Bernard of Clairvaux was a French abbot, reformer of the Cistercian order, influential in ending the persecution of Jews in Germany, served as an arbiter during a split in papal authority, preached in support of the Second Crusade, and was instrumental in is extremely important to the history of the Knights Templar for obtaining Papal support and writing the original Rule of the Order. St. Bernard was born around 1090 AD in Fontaines-les-Dijon (southeastern France). He was born into a noble family. The son of Tocellyn de Sorrell and Aleth of Montbard, St. Bernard was the third of seven children (six of whom were boys). He was educated at Châtillon-sur-Seine, run by the secular canons of Saint-Vorles, which set him up for a life in the Church. In 1107 St. Bernard's mother died and little is known of St. Bernard's life. In 1112, St. Bernard, and several members of his family, rode to the abbey of Citeaux, Dijon, seeking admission into the Cistercian order. On June 25, 1115, St. Bernard, receiving permission from Stephen Harding (St. Stephen), founded a new monastery in Burgundy, naming it Claire Vallée, which evolved into Clairvaux (meaning "Valley of Light"). As a young abbot he became known as excellent orator and author. He would become known as a champion of the Virgin Mary and defining her role in the Catholic Church. Running the abbey were trying for St. Bernard in the beginning and it took so much out of him that he became ill; St. Bernard would be constantly plagued with illness throughout his life. Though the Cistercian order was strict, many people flocked to the monastery, which included St. Bernard's younger brother and father. Clairvaux became so crowded that St. Bernard began sending bands of monks throughout Germany, Sweden, England, Ireland, Portugal, Switzerland, and Italy to found new monasteries. St. Bernard was connected to the Knights Templar through Hugh de Payens, the first Grand Master of the order, was from the Champagne region of France and Andre de Montbard was the maternal uncle of St. Bernard. Hugh, the Count of Champagne, became a member of the Knights Templars and was the one who donated the land on which the Abbey of Clairvaux was built. At the 1128 Council of Troyes, St. Bernard used his influence to use this council to garner support for the Knights Templar. From this council, St. Bernard created the first Rule of the Knights Templar. The Rule covered all aspects of the life of the Knights Templar. Some leaders in the church denounced St. Bernard for meddling in affairs above his station, but changed their minds when St. Bernard wrote a letter of humility and apology that left a positive impression with the Holy See. St. Bernard's influence and popularity in the Catholic Church began to grow immensely that he was instrumental in the election of Pope Innocent II in 1130. This election was very controversial and caused a schism in the Church. Several powers supported Anacletus II rather than Innocent II, the latter had been banned from Rome and was living in France. St. Bernard met with monarchs and then traveled through the Italian peninsula campaigning for Innocent II. The schism existed until January 25, 1138, when Anacletus died, supposedly of "grief and disappointment." It was during the papacy of Innocent II that the order was placed under the sole authority of the Pope. It was also due to the popularity of St. Bernard that the Templar order grew and drew so many prominent noblemen. Around the latter part of 1139, St. Bernard was visited by his contemporary St. Malachi, the Primate of All Ireland. St. Malachi sought to join the Cistercian order, but was refused to do so by the Pope. St. Malachi would die at Clairvaux in 1148. In 1139, St. Bernard was called upon by the Church to combat heresy. Bernard had in previous years denounced the radical words and teachings of Peter Abelard, an Augustinian. In 1141, Pope Innocent II convened a council at Sens (north-central France). St. Bernard denounced Peter to the Pope and demanded that Peter justify his ideas. St. Bernard was able to show the errors of Peter that Peter was unable to make a reply and was forced to retire to Cluny. "The knight who protects his soul with the armor of faith, as he covers his body with a coat of mail, is truly without fear and above reproach. Doubly armed he fears neither men nor demons." After this speech the crowd starting enlisting en masse, and included many men of nobility. St. Bernard traveled to Germany and was successful in recruiting there as he was in France. Sadly, the failures of the Crusades were blamed on St. Bernard, though he blamed the failures on the sins of the crusaders. 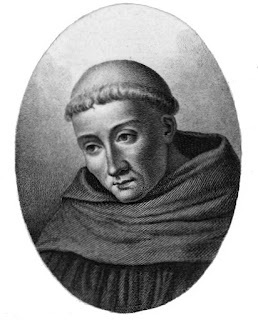 St. Bernard died on August 20, 1153, in Clairvaux. He was canonized as a saint by Pope Alexander III on January 18, 1174; he was also the first Cistercian monk to be placed on the calendars of saints. In Dante Alighieri's "Divine Comedy", St. Bernard serves as the last guide for Dante as he travels through the Empyrean, the highest part of Heaven. In 1792 after the French Revolution, St. Bernard's remains were transferred to the Troyes Cathedral. In 1830, Pope Pius VIII honored St. Bernard with the title of "Doctor of the Church." Due to his writing skills and his eloquent speaking there is not enough time to cover every aspect of St. Bernard's life, but it should be remembered that he played an important role in the ascension of the Knights Templar as the premier knighthood during the Crusades.